Tip two or three tablespoons of oil from the roasting pork joint into a shallow roasting tin. Peel and cube the potatoes, add to the pan and roast for 30 minutes. In a large bowl, mix together the cheese, flour and smoked paprika. Add the hot potatoes and toss to coat evenly in the mixture. Tip back into the tin, ensuring the potatoes sit in a single layer. 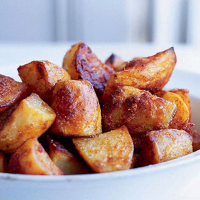 Roast for a further 30 minutes until the potatoes are beautifully crunchy and golden. If cooking these without roasting the pork, the oil can be replaced by one tablespoon of olive oil and a small knob. Grana Padano is a hard cheese from Northern Italy. It can be replaced in this recipe by Parmigiano Reggiano or Pecorino.